The origins of the story trace back to when TAP Biosystems first developed SelecT™, a fully automated flexible batch cell culture system, following consultation with six major pharmaceutical companies. The premise was to address the challenge of generating high quality, consistent cells for drug discovery, on-demand. Following requirements from the pharmaceutical manufacturers, which included GlaxoSmithKline, Merck, Pfizer, Bristol-Myers Squibb, AstraZeneca and Parke-Davies, TAP asked Watson-Marlow for advice on positive displacement pumps that could deliver impressive metering performance without proving difficult to clean. The outcome: a critical aspect of SelecT’s performance depends on up to 15 Watson-Marlow 314D pumpheads mounted vertically on the machine’s external front face. The OEM pumps meter process fluids, such as cell culture media or PBS rinse solution. Using tubing linked to a rack or refrigerator containing the fluids, liquid is moved into the system’s HEPA-filtered aseptic laminar airflow processing area for metering onto cells. Using SelecT, growth and harvesting is commenced by locating flasks of cells into an incubator inside the unit, which are then fed with cell culture media. When the culture media no longer contains any nutrients, the fluid is pumped out of the unit and safely discarded. Over time, the cells will have grown sufficiently to be ready for splitting into multiple batches. Once these are fully confluent (i.e. the entire plate base is covered with a layer of cells) they are harvested, pooled together and dispensed by the robot into the additional flasks or plates ready for the final stages of downstream processing. Cell lines are maintained and expanded in a range of T-format flasks. The design ensures there is no cross-contamination, even when several cell lines are cultured simultaneously. Cells can be harvested, counted and seeded without operator intervention – at any time, day or night – to help optimise screening productivity. The SelecT also makes use of two Watson Marlow’s 313FAC pumps mounted externally alongside the 314D pumpheads. These transfer the fluid required for the washing sterilising the cell collection and dispensing pot. Both the 313FAC and 314D are designed for 24-hour operation. The former offers flow rates of 50Hz up to 1350 ml/min at 270 rpm, while the latter has four rollers for minimum pulsation and accepts seven tube sizes without requiring adjustment. "Today, there are over 40 installations of SelecT worldwide, where it is being used to supply consistent, high quality cells in different plate formats at multiple locations within the majority of the globe’s top ten pharmaceutical companies," says Dr Dave Thomas, product manager at TAP Biosystems. "This qualified success has encouraged us to adopt Watson-Marlow OEM pump technology in other systems." 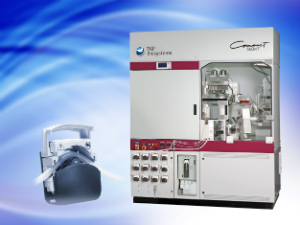 Among these products is the CompacT SelecT, a condensed version of the original system that is designed for smaller, medium throughput laboratories. More than 40 CompacT SelecT systems are in use in laboratories across the world biotech and research institutes, including many for automated stem cell culture and related research applications. TAP Biosystems also uses Watson-Marlow OEM pumps on its Cellmate large volume, single cell production system. Cellmate automates all the processes needed to culture cells in roller bottles and T-flasks, taking cell culture processing from the lab bench to high volume manufacturing scale, without the need for process change. More than 80 Cellmates have now been installed to support the manufacture of licensed vaccine, biologic and cell therapy products.